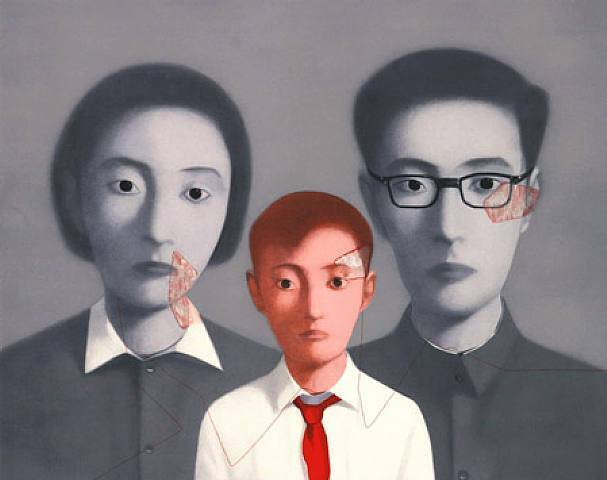 Born in 1958, Zhang Xiaogang is a contemporary Chinese symbolist and surrealist painter. He has made a Bloodline series of paintings, which are often monochromatic, stylized portraits of Chinese people, usually with large, dark-pupiled eyes, posed in a stiff manner deliberately reminiscent of family portraits from the 1950s and 60s. Zhang was born in the city of Kunming in China's Yunnan province. He came of age during the 1960s and 70s political upheavals known as the Cultural Revolution, which exerted a certain influence on his painting. In 1982, he graduated from the Sichuan Academy of Fine Arts in the city of Chongqing in Sichuan province, then joined a young group of young avant-garde painters who came to prominence during the 1980s. Like Wang Guangyi, Xu Beihong and Wu Guanzhong, Zhang Xiaogang belongs to the best-selling contemporary Chinese artists and is a favorite of foreign collectors.